Train operators providing services in the east of England have achieved high and low positions in a national survey which questioned 28,000 passengers. One Rail is the second worst performing train firm with 75% of its passengers happy while survey runner-up Chiltern Railways has a 90% rating. GNER dropped to 82% but the franchise has now been given to National Express. First Capital Connect was rated as fourth worst but c2c, which links Southend to London, came third overall. Anthony Smith, chief executive of Passenger Focus, commissioners of the twice a year survey, said the research should be a wake-up call to operators whose satisfaction ratings had dropped. "In particular, GNER's results dropped to 82% and demonstrate how much trust the new owner, National Express East Coast, has to regain from passengers." 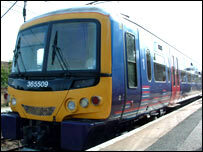 Services run from London through Hertfordshire, Cambridge and Peterborough to the North. One Rail, who run services across Hertfordshire, Cambridgeshire, Essex, Suffolk and Norfolk, said: "The overall customer satisfaction score of 75% represents a 3% improvement on the Spring 2007 survey. "Although this increase in overall satisfaction is encouraging, the survey highlights that there is still room for improvement in train performance. "Passengers are saying that at stations, ticket buying facilities, availability and helpfulness of staff and the overall station environment is continuing to improve." Andrew Chivers, managing director, said: "Although this improvement is encouraging and endorses our approach investing in more staff, upgrading stations and trains, we recognise there is much more work to be done." Chiltern Railways, which won the National Rail's Passenger Operator of the Year award, running services through West Midlands, Oxfordshire and Buckinghamshire, said it knew what its passengers wanted and provided it. It said it was delighted with its rating. First Capital Connect said: "We are pleased to see overall satisfaction improve from 71 to 77%, but there is a long way to go to where we want to be. "We aim to get the basics right and we are pleased to see we are starting to deliver in some key areas including cleanliness, punctuality, security and capacity."